Took the train from Maryland to New York City where we stepped out into the concrete jungle and into ... a huge downpour. Sigh. Not how I wanted my trip to start, hauling a suitcase in the rain without an umbrella (I quickly rectified that situation by purchasing one from a vendor on the street), and got in a cab with my mom and aunt to head for the hotel to check in and wait for my friend, Mariah from Far Escape Reviews. We get to the hotel where I promptly change into jeans because I'm soaked and freezing, wait a bit for Mariah to arrive and then head out to forage for food as we all haven't eaten in like 10 hours. Stop at a diner across the street, have amazing food, return to the hotel where we officially check in (they held our bags in the meantime) and stash our stuff up in the room. 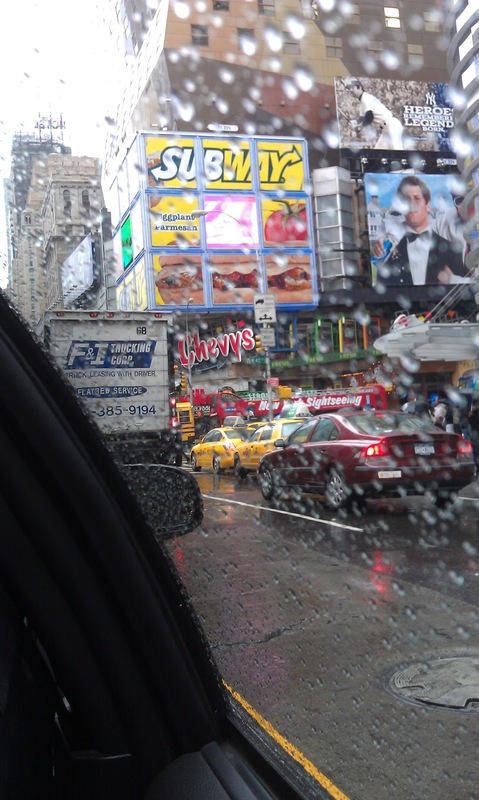 Next we grab a taxi and head for the Javits Center to check in for BEA. Once we had our passes, we head down to the 9/11 Memorial. By this point the rain let up and so we didn't get wet while walking around. I can't say enough about the memorial. It was beautiful and serene and somber. The loudest sound was the water roaring from the two fountains. After that it was back to the hotel where we stopped for dinner at this amazing Irish restaraunt around the block. Then we went to the hotel and crashed to prepare for the next day. It's at this point I need to tell you a bit about myself - I am an obsessive planner. Since July of 2011, I had been prepping for BEA. I devoured any and all posts related to it so I knew exactly what to expect. I knew to wear casual business clothes, but to pair it with a great pair of sneakers. 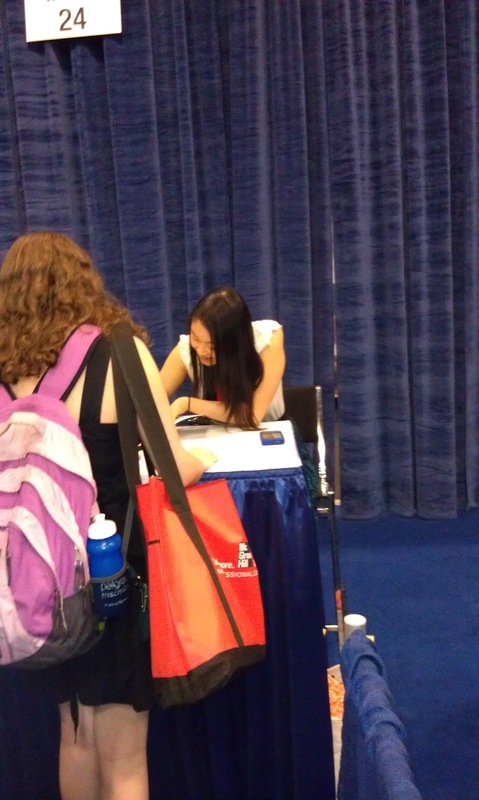 I knew to arrive at BEA at least 2 hours in advance to secure a prime spot in line, and to bring a rolling suitcase to be checked at baggage and keep all my books in. I had three copies of my schedules, passes, and anything else I could think of. I charged my camera, had a portable charger for my phone, mints, and snacks in a messenger bag with a mess of business cards promoting my blog. This was all a big promotion for Melissa Marr's Carnival of Souls. It really started to get everyone fired up and moments later they stepped aside and let us all bum-rush them. I mean, go onto the exhibit floor. Now, I heard a ton of horror stories from past BEA's about pushing, shoving, running, biting ... And while the crowd was intense, I never felt anymore jostled than I would walking down the halls in high school. I'm a Black Friday shopper, so I can handle frenzied crowds. I was not prepared for the massive amounts of books being laying around, ripe for the plucking. I think I got 60% of the books I was craving at BEA in those first 20 minutes. Anyone who was there will probably agree with me that the Little, Brown / Hachette booth was the worst because it was the best. They laid out about 10 books, and it created this huge vacuum of people. Once you got in the aisle, you couldn't get out. I felt like a fish swimming upstream in a hurricane. It was insanity. Once surviving the crush of people at the beginning, Mariah and I headed for our first signing, Rift by Andrea Cremer at 10:30. We basically had over an hour to kill, but needed the time to regroup, check out our books, and make sure we still had all our fingers and toes (good news: we did!). We headed to the line I was excited to see Bailey from IB Book Blogging sitting there. I knew she was planning on going and had swapped with her in the past. I can assure you that she is as sweet and kind in person as she is online. I also met Renee from Alice Marvels and Katie from Katie's Book Blog in this line. I was thrilled that I was 7th in line for Rift. There wound up being a group of about 7 of us standing in line together and we trading off saving each other's spot so that we wander and make book drops at our suitcases. After getting Rift, we wandered a bit before heading to the Harlequin Teen Hour, which seemingly took forever. While in line, Mariah went to make a quick book drop as I held our spot. It turned out that I was leaning on the Scholastic booth and I struck up a conversation with a publicist. I told her about my blog, and she told me to hang on a minute and disappeared ... Only to return with a stack of 15 books for me! She gave me all their MG and YA titles to review, took the time to tell me a bit about them, and even managed to dig up a copy of Maggie Stiefvater's The Raven Boys for me! 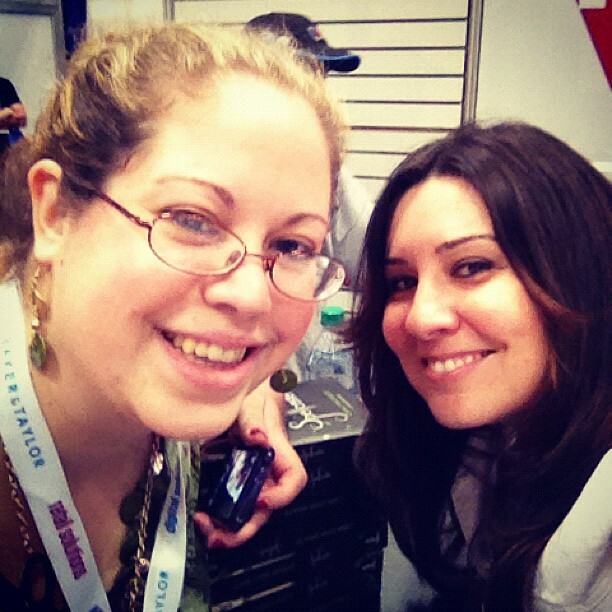 I think one of my favorite moments at BEA was when Mariah returned a few minutes later and just stared at me, saying, "I leave you for fifteen minutes and you got that many books?" By this point, my totes are full and I'm standing there, clutching these new books. While in line, I also got a chance to meet up with Julia from Rex Robot Reviews, who has become my surrogate blogging big sister. Seriously, this girl I awesome and I adore her, and I wish we could've hung out more. The line started moving after that, and what I love about Harlequin is that they set up these signings so you meet 5 authors and get all their books signed at once. I got to meet Rachel Vincent, Julie Kagawa, Cayla Kluver, Kady Cross, and Aimee Carter. I have emailed with Aimee before, and I was so excited she remembered me. After that I hit my suitcase for a book drop after that and realized, with a sinking stomach, that my suitcase was full and it was barely 12:30. So, I did what any rational person would do: I inventoried my books and removed the ones I had grabbed in greed. I took them back to the exhibit hall and set the stack on the floor so someone else could grab them. It was a great reminder for me to watch how much and what I took. 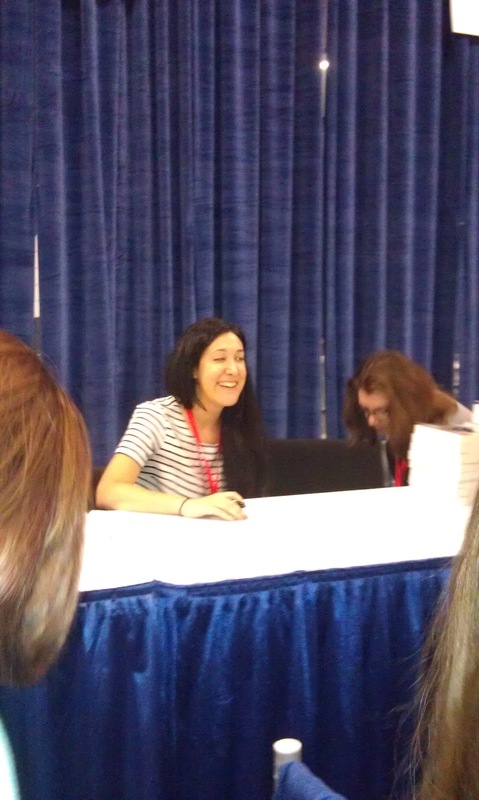 Once that was done, we wandered around, popping in at a few signings, like Kat Zhang's signing of What's Left of Me. We actually left the Javits around 3 because we were just so exhausted. Minimal sleep the night before, plus all the excitement, had left us drained. We were supposed to go to the Teen Author Carnival and we blew it off because we were so tired. I'm sad I didn't get to TAC because I was supposed to meet up with Audrey from Bibliosaurus Text, but she understood how tired I was. Instead we made a quick stop at the post office to mail our books (also found it that it's illegal to take pictures in the post office, hence why there are no pics of the books I grabbed every day), and then go to the hotel. I got to BEA a bit later today. And by a bit later I mean 15 minutes, but those 15 minutes apparently made all the difference because now we were 70 people back from the front of the line to get in. Oh, well, it happens. Wednesday is honestly a bit of a blur. We got on the floor, wandered around and got books that looked promising, and then we got in line for the second Harlequin Teen Hour. This time there was Julie Kagawa (yes, again), Katie McGarry, Maria Snyder, and Cara Lynn Shultz (aka the reason I was in line). Anyone who has read my blog knows I adore Cara Lynn Shultz. 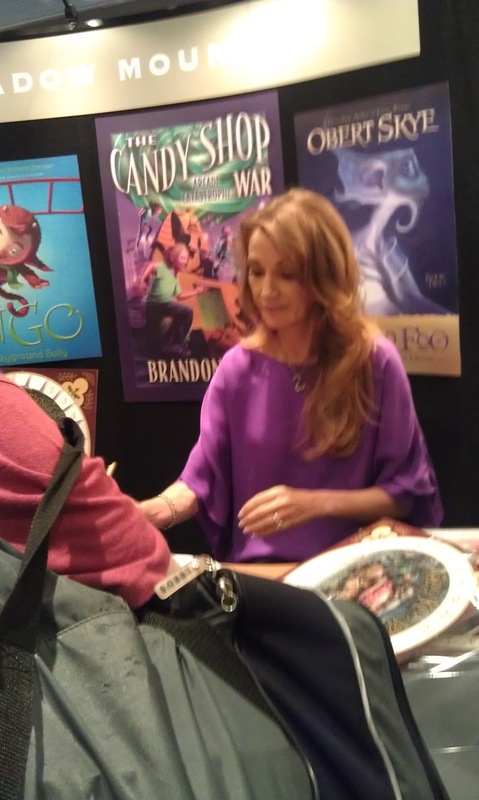 Her books Spellbound and Spellcaster are two of my all-time faves, and I was elated to find out she was signing Spellcaster at BEA. I was even more amazed when she not only recognized me, but asked to take a picture with me! Wasn't I supposed to be the one asking for a picture with her? And then she even uploaded it to twitter and mentioned me. Yes, my inner fan!girl flailed, freaked, and swooned. After this line, we jumped over the HarperCollins line for the Dark Days authors. If you were at BEA, you inevitably ran into this line. It was HUGE. I spanned the length of the Javits center. Mariah and I got there an hour and a half before the signing and were 70 people back. We wound up in line with Darla, and all killed time by making book drops and wandering. While we waited, Jane Seymour (yes, the Jane Seymour) was signing advent calendar's to promote her forthcoming book, Good King Wenceslas. 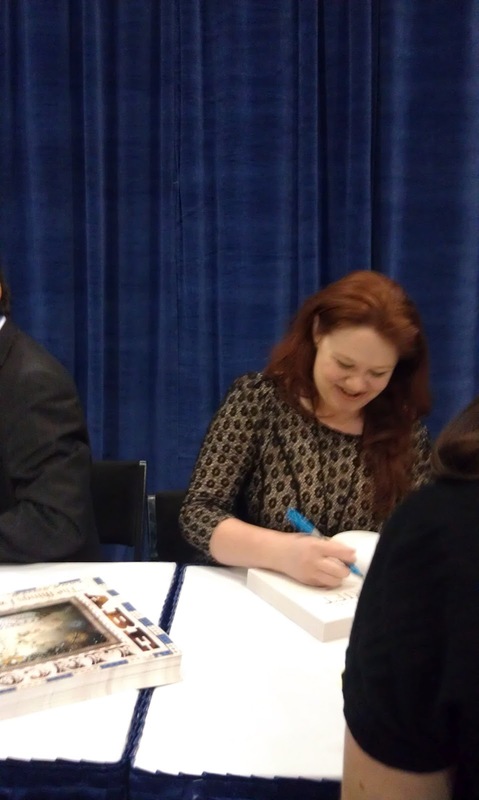 I got a chance to get one signed by her ... and I may have had a total fan!girl moment which we shall not discuss. She's absolutely beautiful. I'd kill for her hair. The Dark Days signing was epic. I mean, not only did I meet Veronica Roth, but also Aprilynne Pike, Elizabeth Norris and Bethany Griffin. No wonder the line was so monstrous. I think the only lines that rivaled it in size were Chris Colfer's and Lois Lowry's. This day was mostly spent waiting in lines. Since I had gotten the majority of the books I wanted the day before, I felt a lot more relaxed. 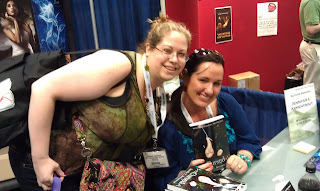 I went to a bunch of signings, including Jennifer Armentrout's signing for Cursed (I also went to her signing for Obsidian the day before) and got a picture with her. Again, I cannot express the utter elation that comes at having an author you hero-worship recognize you. Jennifer was such a sweetie. I also met another Jennifer in this line - Jenny (or, as Jennifer Armentrout and I called her, Jen-nay) from Supernatural Snark. When I went to make a book drop in the suitcase area, I was amazed to stumbled in none other than Audrey. Seriously, what are the odds? I was so glad I got a chance to meet her in person and chat for a few minutes. I love her blog, and she is just an all around sweetheart. We tripped our way out of the luggage area and headed back to the exhibit hall together. But really, that suitcase check area was ... wow. We left BEA around 3 again this day. We were tired, our suitcases were full and there wasn't anything else going on. We again mailed our books (cheering that this time we didn't need the biggest sized boxes to fit all our stuff in), and then headed back to the hotel to chill out before walking around Times' Square. Last day of BEA, and I felt really bittersweet. I was sad to see it end, but at the same time, I was ready for it to be over. We got to the Javits a bit earlier than the day before and ended up about the same place as we had on day 1, and again we were near Darla, Sandy, Val, and Lindsay. I swear, it wouldn't be BEA without those four. I got so used to seeing them everywhere. As Mariah and I are waiting in line, this woman comes up and asks if I wouldn't mind taking a picture of her in the Reached ball. I said sure and she goes up, poses adorably in the ball, and when I give her camera back, we start chatting about BEA. After a few minutes of talking she pauses, and says, "Oh, I'm Diana Peterfruend, by the way." I literally froze for a second. I had just finished writing my review for ForDarkness Shows the Stars before I left for BEA. It was so surreal to meet her. I asked if I could take a picture and she graciously said yes, I told her how much I enjoyed her book, and she gave Mariah and I both bookmarks. Seriously, she was such a doll. Everyone was saying how crazy the last day of BEA was going to be because the power readers would be there. Several NYC book stores had given out day passes to customers, allowing them into BEA for the last day. If anything, it was the opposite. It was quiet and low key all day. The biggest rush I encountered was the one to grab Poison Princess by Kresley Cole when the floor opened up. 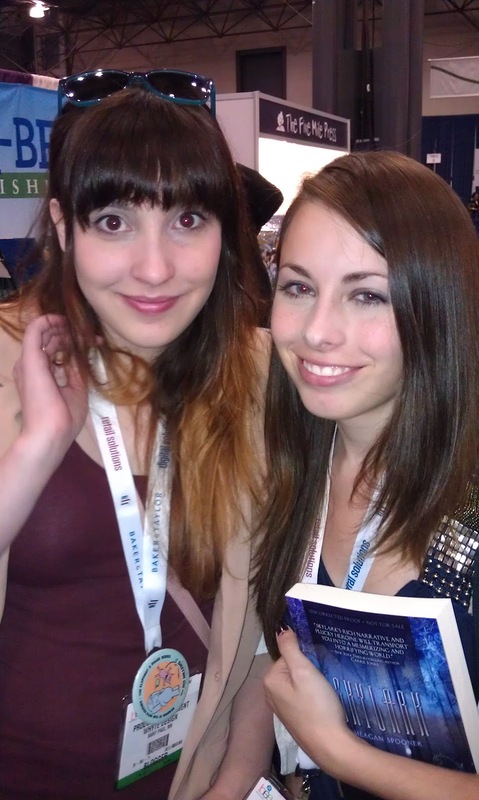 I met up with Julia again, this time to start the signing line for Breathe by Sarah Crossan. Her partner in crime, Brittany from Looksie Lovitz came over, too, and we all waited together. I met up with Renee in this line again, as well as Natascha from Bloody Bookaholic. We had a great time waiting in line. In the middle of it Julia, Mariah, and I ducked out to grab a copy of Carnival of Souls by Melissa Marr when they made a final book drop. After that, I took a second to slip into the author staging green room to meet a publicist I've worked with for a while. I felt oddly like a kid going into the teacher's lounge. I met Alison, the publicist, and she and I chatted for a bit about books and then Jocelyn Davies, author of A Beautiful Dark and A Fractured Light, came over and Alison introduced us. 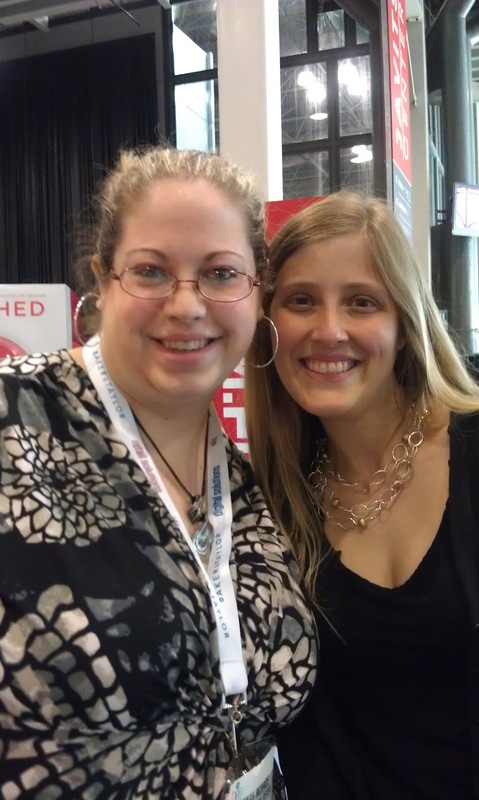 I loved talking with her and getting her perspective on BEA. Then I headed back out to get in line for Breathe with my friends. Once we got Breathe, we jumped in line to get Skylark by Megan Spooner. 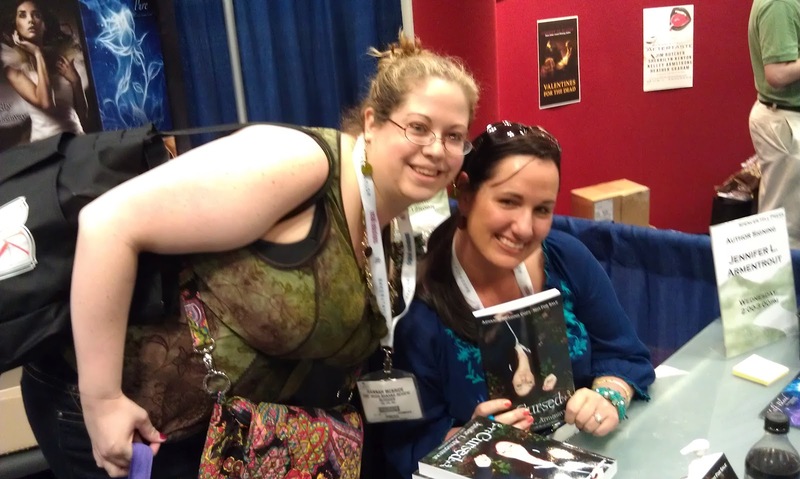 As we waited, we realized that we had time to walk to Jocelyn Davies' signing for A Fractured Light, so we took turns watching each others' belongings and went to get signed copies of that. Once those signings were over, Brittany and Julia took off to catch their train home. Mariah and I wandered around a bit more before calling it a day around noon. We headed outside and stood in the longest line of all to get a cab back to the hotel. 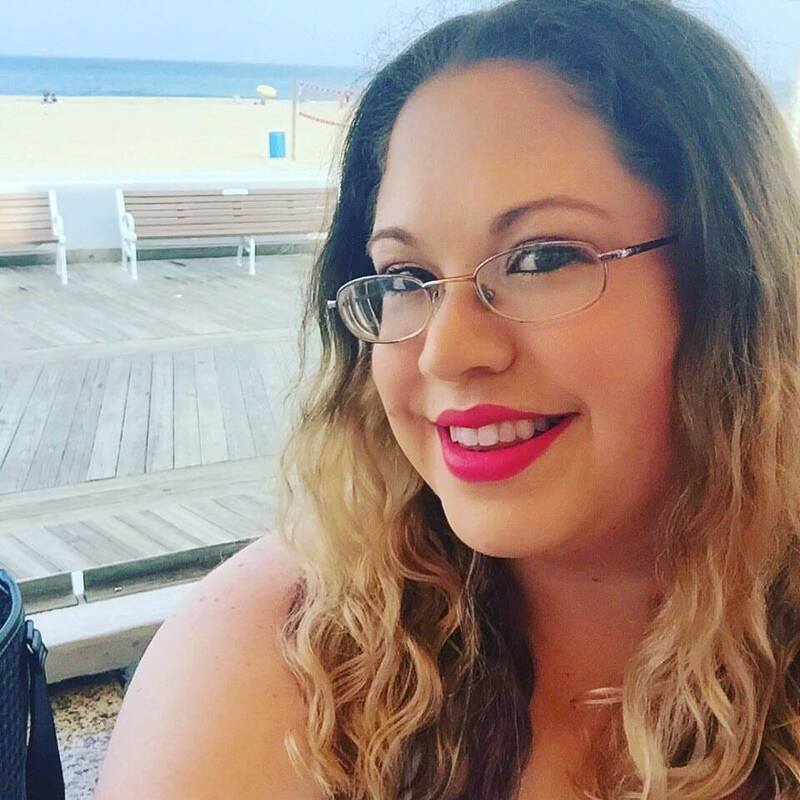 Interview with Rachel Carter, author of So Close to You. Government conspiracies, time travel, and a family mystery that goes back several generations. Plus there’s kissing! As soon as I could read? When I was in diapers? I am totally that clichéd writer who spent every second of childhood with my head in a book; I’ve always known that I wanted to be a writer. When I was in fourth grade I won a poetry contest because I rhymed beautiful lark with frightening dark. I didn’t even know what a lark was! 3. If you were stranded on an island and could only read 3 books for the rest of time, what would you read? That’s such a hard question! Okay, here are three books I don’t think I’ll ever get sick of: Outlander, by Diane Gabaldon. The Bronze Horseman, by Paullina Simons. And…Where She Went, by Gayle Forman. 4. What are your must-haves when writing? Drink, food, music, etc.? I tend not to eat or drink – I sort of go into a writing coma. But I do need music – soft, cheesy and slow. Kind of like elevator music, except good. Bon Iver and M83 have gotten me through some rough times. 5. What books are you looking forward to reading this year? I just got City of Lost Souls by Cassandra Clare. I’m obsessed with Jace and Clary, so that’s at the top of my list! Wow, what a totally crazy month it's been! I honestly didn't expect to extend the hiatus for almost the entire month, but there was just no way. I needed a break. But the whole time I was not here I was avidly reading and setting things up for the coming months (interviews, giveaways, a massive BEA recap post, etc.). Thanks for sticking it out for me to come back! I missed you all! This week I will be at BookExpo America! Then when I come home I will be rushing like a crazy woman because my brother decided he and his fiance are getting married June 10th. I will update as soon as I am able, but be sure to follow me on Twitter as I will be regularly updating and commenting during BEA! I plan on taking lots of video and pictures to document my time at BEA for all of you who can't go, and if you are going ... Hit me up! I'd love to meet you! She's already been contacted and is picking out her prize. Thanks to everyone who entered, and a big HELLO to all my new followers!